I have decided to add a few diary entries from last year at around this time of the year and shall be adding my recent entries over the next few days. I shall also be adding the whole of my New Zealand diary for people to look at at a later stage, but have to work out where to put it as its over 85,000 words. A life on shuffle would not be possible without an iPod and here's a photo of mine. My black classic is 160gb and at the moment (24.04.09 12.05) has various videos and comedy shows on it and a total of 14,291 songs. 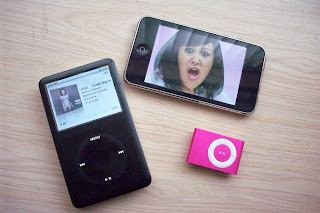 My pink shuffle goes everywhere with me as as back up and my iTouch houses all my music videos.